Are you tired of your dated kitchen? Do you resist having friends over because you are embarrassed about how it looks? If so, it may be time to refresh the room with professionally installed new kitchen countertops. With so many options out there, it is easy to find one to fit your style. However, at first the sheer number of choices today can be daunting. To select which would work best for your home, you should first contemplate what your needs are in terms of visual appeal and function. If you are looking for a dramatic showpiece, you might consider natural stone such as granite or marble. Granite comes in a myriad of colors and has beautiful swirled patterns and veins. Marble also shows off its stunning natural beauty and is often found in a gorgeous white color. Both of these materials easily match decorating styles from traditional to modern. Another option is to install an engineered material like quartz which works especially well with a more contemporary décor. Since these are made of pressed natural minerals and resin, quartz has a more uniform look than the natural slabs. When it is being molded, color pigment is added to create an assortment of colors. Another factor to consider when choosing kitchen countertops is the care that each material requires. 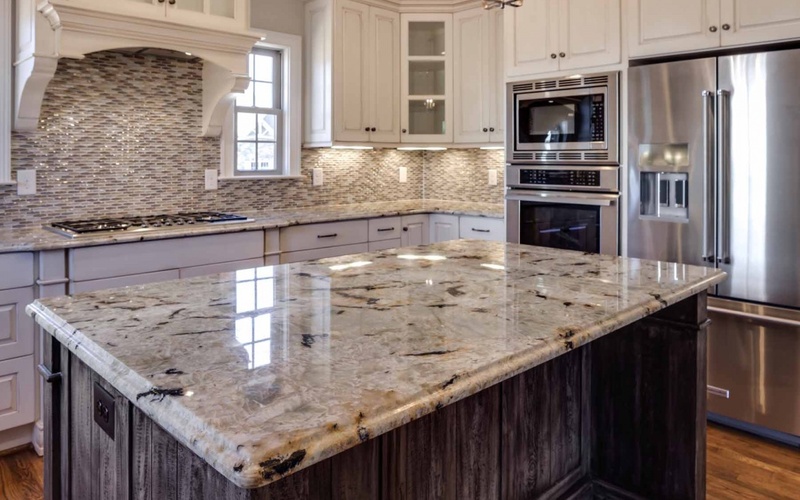 For example, granite is hard and relatively low maintenance, but does need to be professionally sealed on a periodic basis so it remains waterproof. It is basically heat resistant, but caution should still be taken. Marble requires more maintenance and care as it can stain, scratch and chip more easily. Quartz is the most durable and is cleaned with just soap and water. It does not require regular sealing. If you are ready to make a change in your kitchen, you should definitely consider installing new kitchen countertops. They can refresh your entire room and help you to love your kitchen once more.